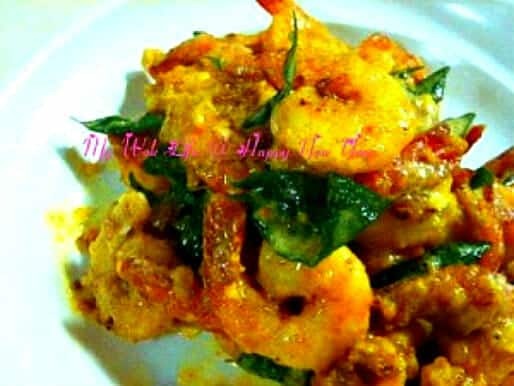 One of my readers, was checking out salted egg yolk prawns recipe, and I couldn’t remember that I had actually posted the recipe since a while ago (laughing). Oh well, I did tell her about it, just few days back. And this time, I am going to post another version of salted egg yolk prawns, for the healthy you, and all, for this coming Lunar New Year, of course (smile)! Most importantly, with similar ingredients and steps from my previous recipe, it is never a chore to cook this for your reunion dinner and/ or gathering with friends and relatives. Yes, to the cook, it would not be a difficult dish to prepare. As to the diners, this dish should be great, too, as you do not have to peel the prawn shell during your meal. If that’s what you hate about eating prawns, they are all shelled in this recipe of mine! But of course, cooking the prawns with shell intact has its advantage, too. It helps to absorb and seal the flavor and aroma to its fullest and make each prawn taste more succulent, in a way. So, for the shelled prawns, I have, in this recipe, tried to elevate the overall flavor of the dish with some adaption to the ingredients or its amount used. Perhaps, do it like me, simply place the lightly dusted (with corn starch) prawns in the hot oil to fry for just 15 – 20 seconds. The effort is to make the prawns more aromatic, bouncy and moist to the palate. I did not deep fry my prawns the usual way (dredged in thick flour batter or with more starch coating) as I did not feel like eating deep fried stuff at that moment when I cooked this. Of course, I knew crispy deep fried might taste even better, to some of you. So, you make the choice. 1) Devein (cut a slit at the back of the prawn to remove its vein), rinse and pat dry the shelled prawns. Season with chicken granule and pepper for 30 minutes or longer. 2) Briefly chop the cooked salted egg yolk, and set aside. 3) Dip shelled prawns in beaten egg yolk. Then, dust the prawns with corn starch. Heat wok with oil over medium-high fire, and then, put the prawns in the hot oil to deep fry for 15 – 20 seconds and immediately remove from wok and drain on strainer. Return the cooked prawns into the hot oil for another few seconds and remove to drain on strainer again. Set aside. 4) Remove excessive oil in wok, leave only 1 – 2 tablespoons and reduce heat to medium fire. Add in minced garlic and curry leaves and stir fry till aroma releases. Then, further reduce heat to low fire, melt butter in wok and add in salted egg yolk. Use the spatula to mash and stir-fry the yolk (in quick circular motion) immediately. Once the ingredients appear foamy and aroma of the mashed yolk releases, return prawns to the wok and add in chicken granule, sugar and salt. Toss all the ingredients till well blended. Dish up, and serve with steamed white rice. A serving of my Salted Egg Yolk Prawn counts about 250kcal. Tips: Use of larger prawns is recommended as gotta take the shrinkage of the cooked prawns into account. * Add cut some Chili Padi (Bird’s eye chili), if wish to spice up the taste a bit more. Add in the chili together with curry leaves. Beware of the pungency when cooking. * Instead of the quick frying method I have used here, the usual deep frying method can also be done by encasing the prawns with more corn starch, or thick flour, and even tempura batter. Then, deep fry for longer time till the prawns are entirely crisped and browned. Great dish! I am still trying to master the skill to cook this dish.. =) a bit sinful tho..
Cook this more often and you will be able to cook it better and better. It will depend on the ‘stove’, as it has to be the right heat to cook it nice, Chinese always says. Have to say that this dish does make me hungry at night and miss singaporean food more!